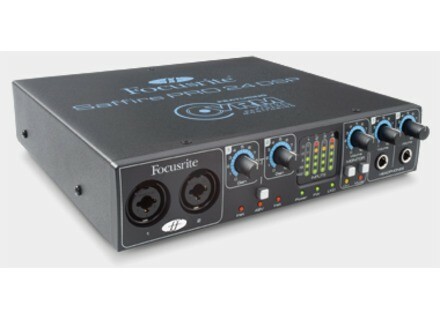 Saffire Pro 24 DSP, FireWire audio interface from Focusrite in the Saffire series. Focusrite's range of external digital audio interfaces is very comprehensive, including the small Saffire 6 USB with 2 ins/4 outs, the big Saffire 56 with 28 ins/outs, the Pro 40 with 20 ins/outs, and two Saffire Pro 24 (16 ins/8 outs) with or without integrated DSP. We will test the version with integrated DSP, MixControl 2 software and VRM technology (Virtual Reference Monitoring). 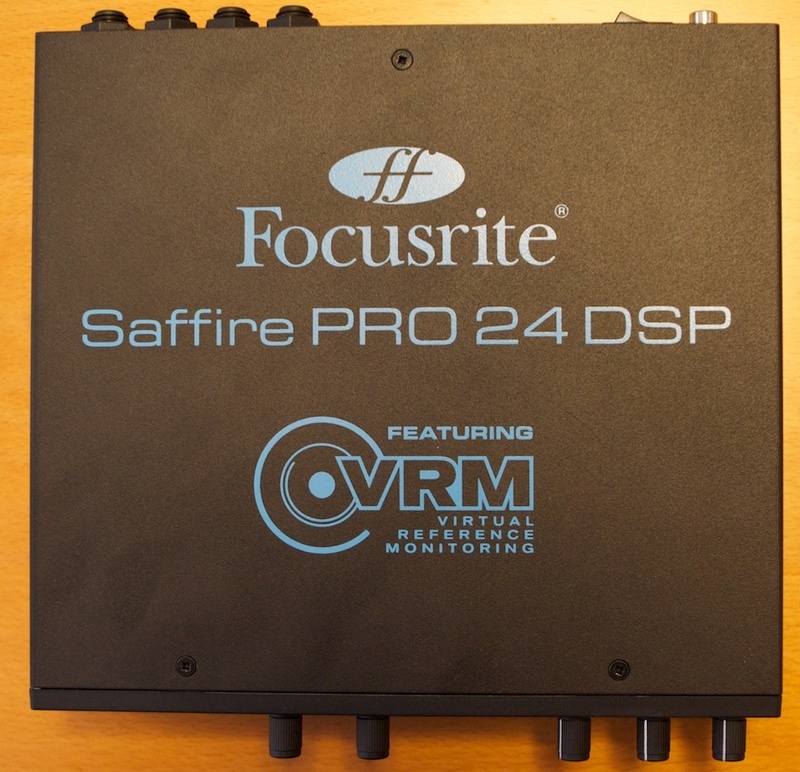 The Saffire Pro 24 DSP didn't really impress us when we took it out of the box... The interface, which is a bit less wide but deeper than the M-Audio ProFire 610, has a very classic look compared to the TC Electronic products for example. Its dimensions and weight are standard: 8.5" x 1.8" x 8.65" and 3.5 lb. Everything looks pretty sturdy. It includes four sticky rubber feet for the bottom so that it doesn't slip off. The controls are small but easily accessible since they are well spaced out. The interface is provided with a six-pin FireWire cable, a mains adapter (in case the computer's FireWire interface cannot provide enough power), a "lite" version of Ableton Live 8, one GB of "Loopmasters" samples, the Novation Bass Station virtual synth, and the drivers CD, of course. The front panel of the interface features two inputs on Neutrik combos (XLR + 1/4" TRS), with switchable 48V phantom power, to connect a microphone (dynamic or condenser mic), a musical instrument or a line signal. The selection between instrument and line source must be made via the MixControl software because the interface does not provide any input level selector. A small, red LED is the only way to know that instrument level is activated. The interface also provides two gain controls for the inputs; their range is from +13 dB to +60 dB for the mic and instrument signals. The gain range of the Line-level stage is -10dB to +36dB. In the center of the front panel, four level meters with five LEDs each show the signal level for each of the four inputs. It's not ideal but it's still better than the ProFire610 or the Impact Twin... Three green LEDs allow you to monitor the on/off status, the FireWire connection and the internal or external clock sync. On the right side of the front panel, you'll find three additional volume controls. The first one is conceived for studio monitors and also features mute and dim (-18 dB) buttons. The two other volume controls are dedicated to the pair of headphones outputs. Each headphones output can have its own mix (see below), which is a very valuable feature! The rear panel hosts the connectors, i.e. analog and digital ins and outs. On the left, you'll find two coaxial S/PDIF connectors (in and out), the power switch (we would rather have it on the front panel...) and the connector for the mains adapter. You'll also find 5-pin DIN MIDI in/out connectors, a 6-pin FireWire connector, an optical input to be used with ADAT or S/PDIF signals, and six analog line outputs on 1/4" TRS connectors just like the two analog line inputs (3 and 4). You can connect balanced or unbalanced jacks to the interface and choose between two different levels (Hi and Lo Gain with +16 dBu and -10 dBV respectively) using the MixControl software. The Saffire is provided with a virtual mixer called MixControl. It allows you to manage up to seven different mixes (one stereo main mix plus six mono mixes) you can assign to any output (line and headphones outs). Each mix can include up to 16 channels feeding the interface (analog and digital inputs, returns from the integrated reverb and returns from the sequencer). In short, the MixControl allows you to create perfect monitoring conditions for you and all musicians! In other words, it plays a crucial role. After you open the virtual mixer, you'll see several tabs to toggle between your different mixes. Everything else is rather standard: each channel includes a volume fader and a pan control, as well as mute, solo and PFL buttons. A tab on the right allows you to set the send level to the integrated reverb, which is dedicated to monitoring applications only. The lower part of the MixControl can have three different functions: it allows you to manage the compressors and EQs inserted in the first pair of analog inputs, manage the routing and level of all analog inputs or activate the famous VRM parameter (Virtual Reference Monitoring) that allows you to virtually change your reference monitors. The two first analog inputs can be processed with their own EQ and compressor, whose position in the signal path is interchangeable. The compressor provides five adjustable parameters: threshold, ratio, attack time, release time, and output level, while a small meter shows the gain reduction. As you can see, only standard features so you won't be thrown off balance! The EQ has four parametric bands. For the highest and lowest bands you can choose a shelving or cut filter. The two mid filters have an adjustable bandwidth (Q). Both tools are comprehensive and allow you to EQ and compress while recording. All processing can be recorded or ignored thanks to the return function. It's up to you! The routing matrix allows you to select the mixes you want to route to the headphones outs and the digital S/PDIF outs. On the lower right side of the mixer you'll find a big rotary knob for the main volume control, as well as some other options to mute or dim the signal and to deactivate some output channels. You can also adjust the sampling rate (up to 96 kHz), the sync source (internal or external via S/PDIF or ADAT) and the latency. This pompous name stands for a very original and priceless feature. VRM will allow you to simulate monitoring speakers and rooms via the headphones output. VRM includes three room models (a big professional recording studio, a home studio and a living room) and fifteen reference speakers (ADAM S2.5A, Alesis Monitor One, Auratone 5C, Genelec 1031A, Yamaha NS-10M Pro, television, hi-fi speakers, multimedia speakers, etc.). The main advantage of this function is that it allows you to mix with a pair of headphones and listen to your work in different configurations without standing up from your seat (we all know how tiring that can be...). VRM uses both convolution and modeling technologies: convolution for the speakers and modeling for the rooms. VRM also takes into account the shape of the human head in order to recreate an adequate stereo imaging. It also allows you to choose different listening positions within a room: six listening positions are available in the professional recording studio and the home studio (in the middle of the room, to the right or to the left and also further away from the speakers), and eight listening positions in the living room. In short, VRM is a very comprehensive and valuable monitoring system. In use, VRM proves to be an interesting feature. It allowed us to listen to our mixes with a pair of headphones and detect some imperfections which we hadn't noticed with our main speakers. Considering that a good mix ought to sound good with any pair of speakers, having access to several virtual monitoring systems is a real plus. Home studio owners producing for broadcasting companies (television, radio, etc.) will also be interested in listening to their mixes through television or low-budget speakers. Note that you cannot use the VRM function and DSP processing (EQ, compressor and reverb) at the same time. 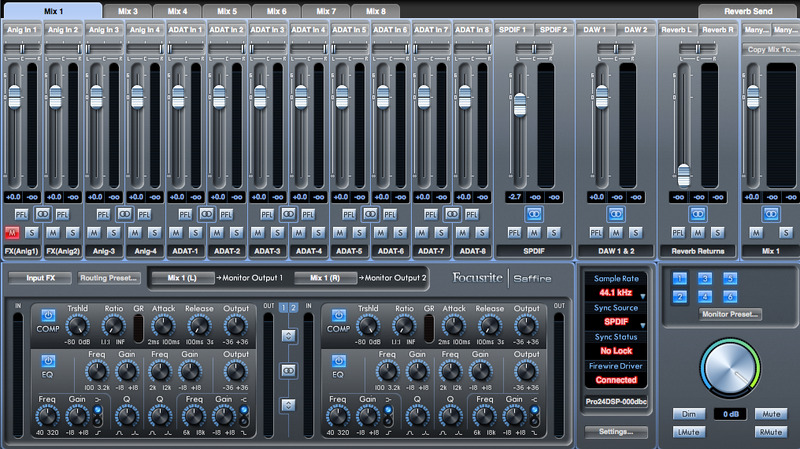 If you want to listen for yourself, here you have a mix using VRM with different configurations. Use your headphones! 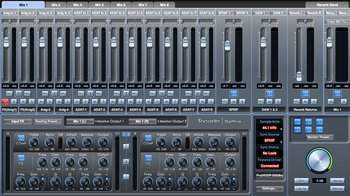 The Saffire Pro 24 DSP is provided with a plugin suite with Windows (VST) and Mac OSX (VST and Audio Unit) support. The bundle includes an EQ, a compressor, a noise gate, and a reverb. The compressor and gate have been modeled after the manufacturer's own hardware processors. The reverb is based on algorithms. Once you authorize the plugins via Internet you'll discover sleek and effective GUIs with several gray controls. Each plugin is provided with factory presets you can select directly from the GUI. The compressor has the same adjustable parameters as the insert compressor of the MixControl: input level, threshold, ratio, attack time, release time, and output level. Add a gain reduction meter and you get a comprehensive and effective compression tool. Its sound recalls opto compressors from the 60's and it will allow you to color the signal. The EQ and reverb plugins are the same as the processors available in the MixControl: four-band parametric EQ and reverb with three adjustable parameters (size, pre-filter and air). The noise gate will allow you to suppress unwanted noise or create gating effects thanks to the adjustable parameters: threshold, hold time, gain reduction range (up to 80 dB), attack time, and release time. A small meter shows the gain reduction. There are several operating modes available, as well as a side chain to control the gate of the second channel with the signal of the first channel and vice versa. Even if all four plugins are very basic, their sound quality is irreproachable and that's definitely a huge plus of this digital audio interface because it allows any user to start working immediately under good conditions. Below you can listen to a bass guitar connected to the instrument input of the interface (1) recorded without any insert effects, (2) with the compressor, (3) with the EQ. 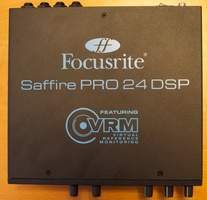 And in practice, how does the Saffire Pro 24 DSP work? The Focusrite interface is very pleasant to use, installation is a breeze and we had no problems during our test. The Saffire was very stable with our MacBook Pro and we had no drop outs. The MixControl software is comprehensive and flexible, even if it looks a bit complex at first sight. The possibility to create up to eight different mixes that can be routed to the headphones or line outs allows you to easily manage the monitor signals for the musicians during a recording session. Both available insert effects (EQ and compressor) sound good and the quality of the reverb is above average. With its number of analog and digital ins and outs, the interface is very comprehensive — more than the ProFire610 (which has no ADAT) and the Impact Twin (with only four analog outs and two identical headphones outputs). The resolution of the Saffire's small meters is better than that of its competitors. We just miss a physical switch to choose between instrument and line level for the 1/4" inputs. For about $400, Focusrite offers a very comprehensive and reliable audio interface with 16 inputs and 8 outputs (analog, S/PDIF and even ADAT!). The software package is also very interesting. It features a virtual mixer called MixControl that can proudly stand up to its competitors. The routing functions are very flexible and you can create up to eight different mixes assignable to the line or headphones outs. The insert processors available for the first two inputs make a very good job, while the VST and AU compatible plugin suite is a valuable complement. The icing on the cake is the VRM technology that allows you to simulate different rooms and speaker pairs in your headphones. You'll be finally able to mix in silence! The Saffire Pro 24 DSP is certainly one of the best digital audio FireWire interfaces in the $400 price segment.